New BAL Flexbone uncoupling solutions for any substrate. 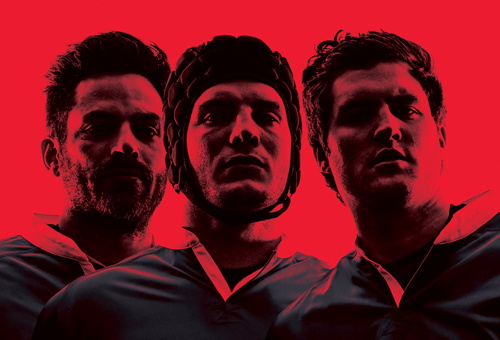 Following the launch of the revolutionary and award-winning BAL Rapid-Mat in 2014, the Flexbone range offers two very different solutions to the UK market with the launch of Flexbone 2Easy and Flexbone VAried. Unique to the UK, and bound to excite fixers, contractors and distributors alike, BAL Flexbone 2Easy is a floating mat system – where NO adhesive is needed underneath the mat system i.e. the mat is truly uncoupled. And because no adhesive is required, preparation is reduced to a quick sweep of the floor as long as it’s flat and sound! This means that contaminated and stained floors, wooden floors, cracked screeds and mixed substrates can be tiled immediately. Tile direct onto difficult substrates such as bitumen, fresh sand:cement screeds or new anhydrite screeds that are not fully cured (up to 1.5% CM residual moisture). 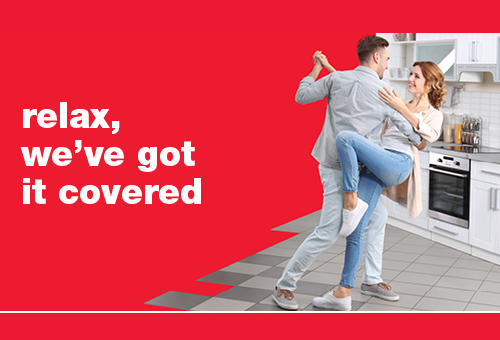 Lengthy waiting times on new screeds can be avoided with no more projects on hold while new screeds are dry enough to be tiled directly, or fixed with a traditional bonded system. 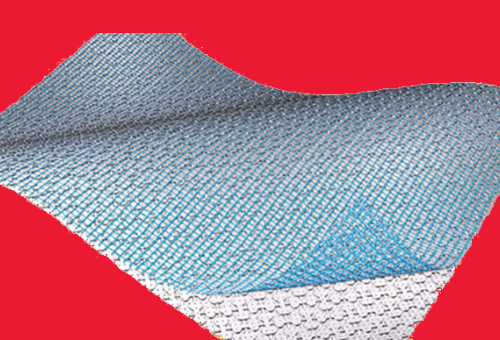 Fast track installation in possible as any residual moisture in the substrate is distributed evenly through a system of channels and can also ventilate via the covering joints through perforations in the mat. BAL Flexbone VAried is a bonded mat system, with the same installation process as other fixed cavity mat systems in the market. Unique to BAL Flexbone is the patented GripLock Technology and unique bone structure. The patented design has been independently tested to provide the highest shear strength (providing more accommodation of higher levels of lateral movement) and the highest tensile strength (to stops tiles ‘popping-off’ or cracking under pressure). 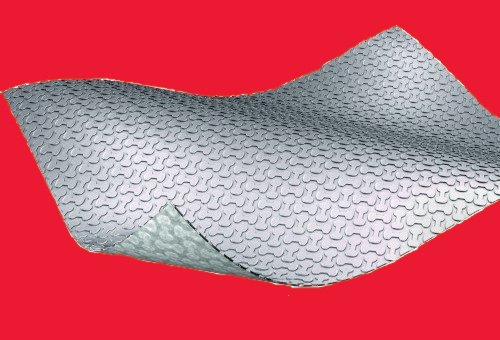 These highly flexible and deformable properties ensure all tile installations are protected from lateral movement and pressures, while a special fleece provides for vapour pressure compensation. Fixer trials have shown that the unique bone-shaped cavities are much easier and faster to fill with adhesive than the conventional square or round cavities – this means spreading time is cut by circa 30%. BAL Flexbone VAried provides a waterproof layer, meaning no tanking is needed in wet areas such as bathrooms, showers and wetrooms when BAL Flexbone VAried is installed. The bonded mat is perfect for high load-bearing and commercial areas such as shopping malls, airports, car showrooms, office building and hospitals, as well as light or medium traffic areas. New from BAL, Rapid-Flex One is a high-performance S1 tile adhesive that provides fixers with superior qualities to get the job done on time and on budget. 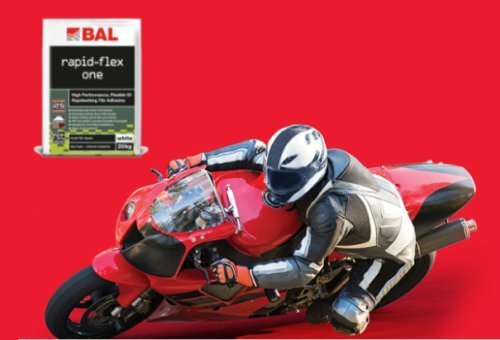 Fast, strong and flexible, BAL Rapid-Flex One is an ultimate all-round adhesive with extended 30 minutes open time and 60 minutes working time – giving fixers speed but crucially all the control – and is still ready to grout in just 3 hours! Formulated with FST for enhanced performance, a super smooth consistency provides easier and faster spreading. With superb flexibility and just one white colour for use on any installation, it’s truly the Number One rapidset adhesive! BAL tiling solutions have further expanded their range of products with two new preparation products to help ensure your tiling lasts the test of time. For the first time ever BAL have introduced a new lightweight tile backer board for all internal environments. BAL Board is a moisture and water resistant alternative to plasterboard and timber when fixing tiles. It is easy to cut and install and provides a strong base for tiling. BAL has also introduced onto its range a new multi-purpose damp proof membrane, waterproofer and primer. BAL DPM is suitable for use on screeds with up to 98% RH readings, or up to 87% RH on anhydrite screeds. BAL DPM helps protect walls and floors from damp, moisture and chemical attack. BAL Board is a specialist magnesium oxide tile backer board. Its unique construction uses the highest quality raw materials and is manufactured under strict ISO approved quality control procedures to provide superior performance against all other backer boards. The high quality construction means that the BAL Board can proudly provide BBA approval and our trusted 25 year guarantee providing fixers and contractors with peace of mind that their tiling installations will last the test of time. Affording fixers with a strong and stable background for wall and floor tiling in internal environments, the BAL Board is water and mould resistant and will not swell, rot or degrade over time making it ideal for wetrooms, bathrooms, kitchens and wet areas in leisure facilities. It is also suitable for use with underfloor heating. BAL Board is perfect for fixing large format wall or floor tiles. 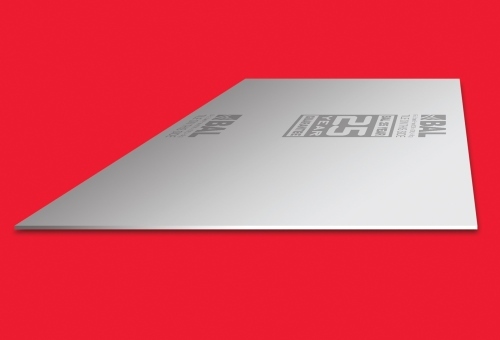 With a weight tolerance up to 100kg per m2, it’s the strongest board on the market with a superior weight tolerance than plasterboard or timber based sheets. Even easier to install, BAL board is 15 -35% lighter per m2 than cement-based board. No specialist cutting tools, fixings or screws are required for installations. Because it can be simply cut with a craft /utility knife or sharp blade and screw fixed with standard stainless steel or hot dipped galvanised screws (to timber studwork), costs are significantly reduced. What’s more, it has minimal dust when cutting, meaning it is safe for the fixer and the environment. BAL Board is fixer approved having scored significantly higher in end-user tests than alternative leading cement-based boards with 100% of fixers trialled preferring the BAL Board over the equivalent leading cement-based board. Available in 6mm and 12mm thicknesses, the easy to carry and transport 1200 x 600mm sized boards are simple to install and secured at 300mm intervals, eliminating waste and reducing unnecessary cutting. Available from BAL stockists from October. Many problems which occur with floor coverings are as a result of moisture in the subfloor, so it is essential that the final floor covering is protected from the passage of moisture from below. 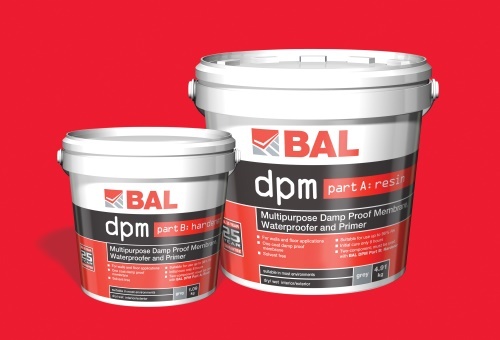 Now BAL have solved this problem for tilers with the introduction of new high performance, multi-purpose one-coat DPM and primer, creating a barrier against damp and moisture on floors AND walls with up to 98% Relative Humidity (RH). BAL DPM is resistant to water, chemicals, grease and pollutants, and can be used internally or externally either as a DPM, primer, waterproofer or residual moisture suppressant. As a one coat primer with aggregate, it allows tiling onto difficult substrates such as steel and masonry, while it also aids adhesion onto flooring grade asphalt and bitumen. New BAL DPM can be used on sand:cement screeds, power floated concrete and exiting tiles on walls and floor for basements below the water table. What’s more, it can also be used on anhydrite screeds with up to 87% RH, meaning less waiting and quicker tiling for fast track installations. BAL DPM can also be utilised as an easy two-coat waterproofing system for walls and floors – perfect for use internally or for BAL external tiling systems.